It’s that time of year again when I try to stop procrastinating and get my holiday shopping done in advance before the stress of the holidays truly kicks in. Our plans this year are to head to Los Angeles for a quick five-day trip to celebrate the marriage of one of my best friends before heading back to Europe to spend Christmas with Nico’s family in France. Truth be told I actually hate shopping, for the most part, because I feel like I should be saving money for silly things like um well, a house or perhaps a baby one day — but it is a necessary evil and the best way to get over parting money is to make that gift count. Less is more in our household, partly from lack of space but also because I am more inclined to gift an experience or a small item from an artisan than just filling our space with stuff I find online. 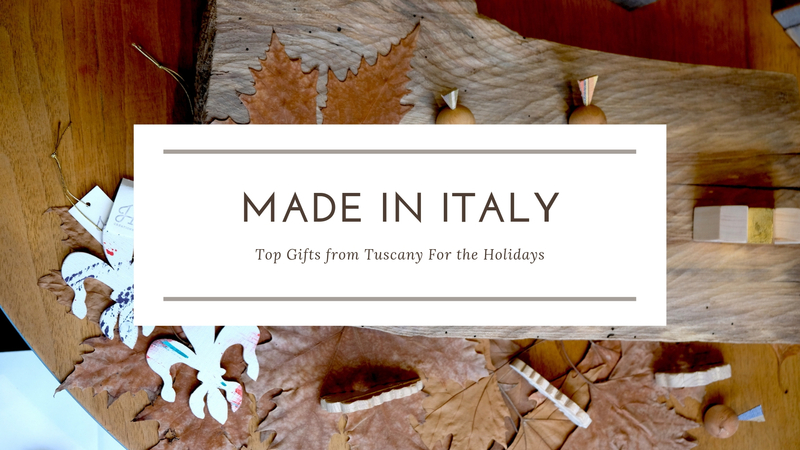 I’ve been doing this roundup of Made-in-Tuscany goodies for a number of years now and it’s a heck of a lot of fun to research, especially in a city that prides itself in maintaining a high level of artisanal craftsmanship. What I try to keep in mind are a variety of budgets, unisex options and whatever generally catches my eye. I also asked a number of friends here in the city to add what they would choose to make the selection even better for you all so it’s a bit longer than usual this year. Jane Harman is a friend of mine, a talented wood restorer and artisan dubbed the “Oltrarno wood whisperer” by Mary Grey from The Florentine. 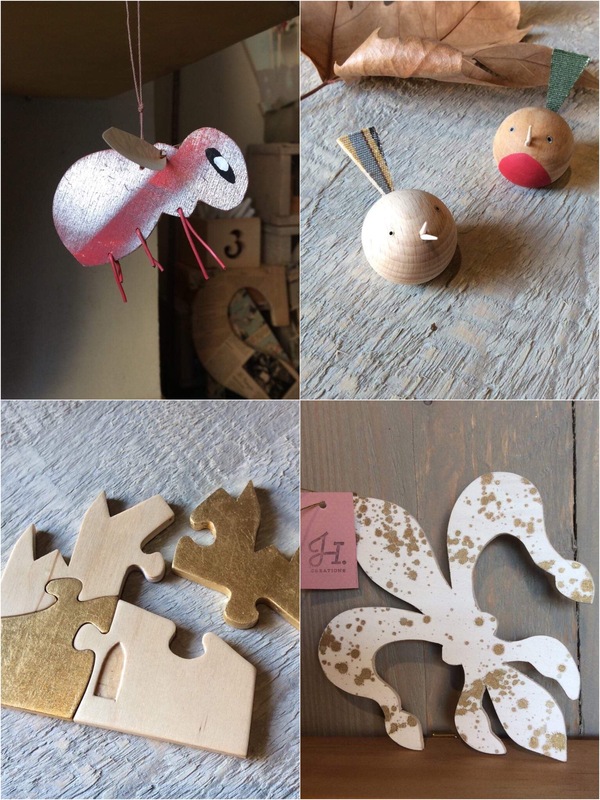 I genuinely love everything she creates, and especially her gilded, natural wooden houses, Florentine lily ornaments, statement jewelry and wooden home decor letters decorated with recovered paper (this can be totally personalized), all of which make for fantastic gifts or even souvenirs for yourself! Prices range from €6 /€10/€16/to €58 circa. You will find her at the ETSY handmade market December 1st and 2nd at The Student Hotel or you can pop by her shop at Via Lorenzo Bartolini, 1, 50124 Firenze FI. Her easy online shop can be found here. 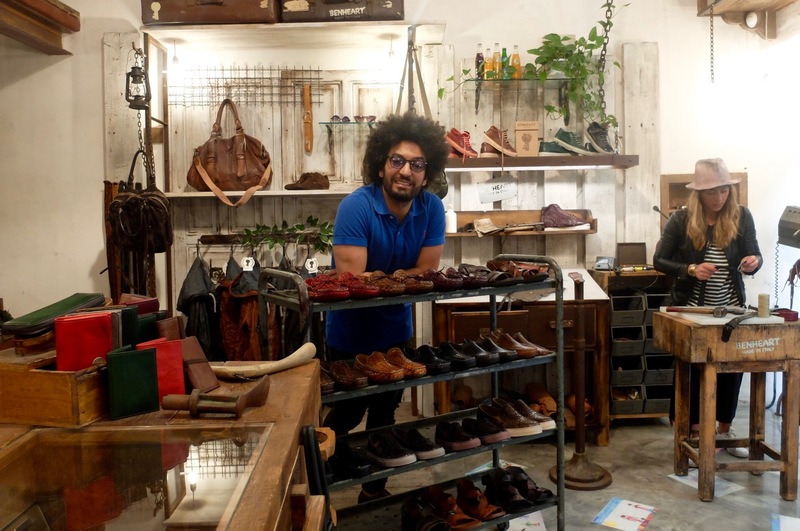 I just wrote about the guys of Cuoiofficine on Via Guicciardini, leather-whispers who quite frankly have me drooling over every single accessory they have in their shop. For the holidays, one of their fabulous wallets (see this pink one below that Timothy explains) or a simple cross-body purse with a removable marbled flap cover would make for a great gift. This year I plan on heading to Eataly Firenze to pick up a number of items for family and friends (and ahem for myself) while most people go there for the food items, keep an eye out for the Nesti line of soap bars ( a great Florentine brand from 1947) and the line of shower gels and shampoo/conditioners of “La Florentina” founded in 1894 with a special line dedicated to the citrus fruits of the Boboli gardens (shower gel €7,40). On the food front I would go for their organic Mocine vin santo, a lovely dessert wine from Tuscany, the extra virgin olive oil selection from Frantoio Franci selection (from Montenero d’Orcia – Grosseto) and Christmas desserts! Think Ricciarelli & Panforte, both traditional Tuscan desserts from the Siena area and of course panettone & pandora, of which they have a tremendous selection! Probably though my favorite item by Eataly is their selection of gastronomic courses that would for a great gift! Prices start around 15-20€ and they offer a really interesting mix of courses: everything from chocolate making, courses for kids, wine-tasting and so much more! My friend and guide Molly Mcilwrath chose an original etching of the classic Italian Moka coffee pot by Gianni Raffaelli of L’Ippogrifo Stampe d’Arte. 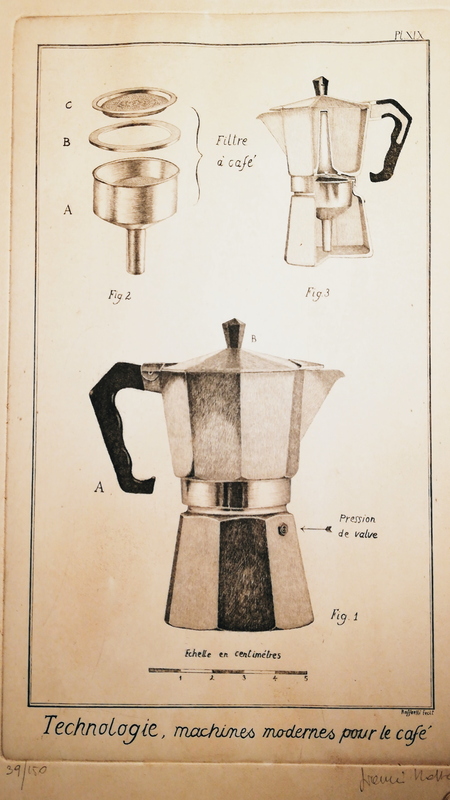 The Moka is an object you can be sure every household in Italy has and here it is illustrated in the style of 18th century French “Encyclopédie” by Diderot and D’Alembert. What she loves about this true “acquaforte” etching is that it’s a fun representation of so much in one image. You have the Italian household manual stove top technique of making a caffe’ as well as a reference to an extraordinary book on the world’s knowledge of the time. This particular etching represents an age old traditional artisan craft but with a contemporary twist – and it’s a piece of artwork that would look good on any wall. You can visit the shop on Via di Santo Spirito 5/r and you can check out this item online. The etching costs 70€. 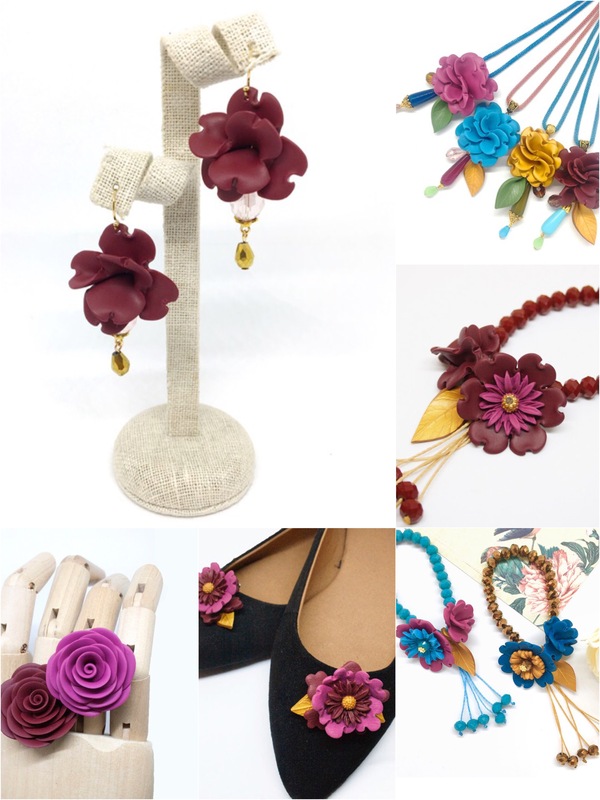 Contemporary artisan Sara Amrhein, whose handmade jewelry I regularly gift to friends and family, is offering a really amazing holiday sale “Buy any three items and get the fourth one FREE!” This means that you can mix and match between the Long Flower Necklace, the Small Flowers Earrings, Rose Rings, Shoes Clips, and Flower Bracelet all handmade by Sara in polymer clay. Choose any colors you’d like, they can all be different or you can buy them as a set. They make perfect gifts for teachers, babysitter, girls night gift exchange, or even stocking stuffers. Get one for all your besties and one for yourself! They come wrapped and ready to give! Prices range from around €35 and up! You can visit her shop at Via dello Sprone, 9r in Florence or purchase items online at Shopify and Etsy! 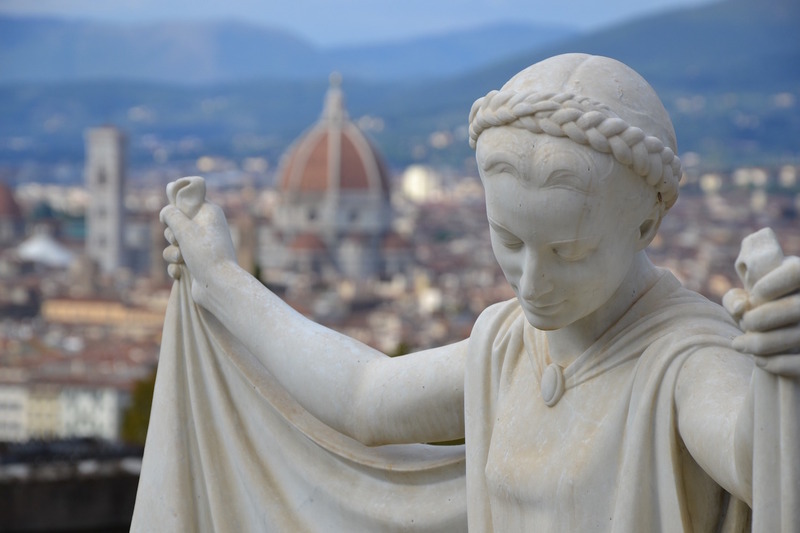 Next up (I hounded a lot of friends for this article) are the suggestions by guide and soul sister, Alexandra Lawrence (you may remember her from our live videos discovering Florence on Facebook!). Her local go-to this year will be Florence Factory—an amazing space that has brought together some of the most inspired artisans from Florence and beyond. The emphasis is on design, so I find it offers something more than the traditional take on local crafts. 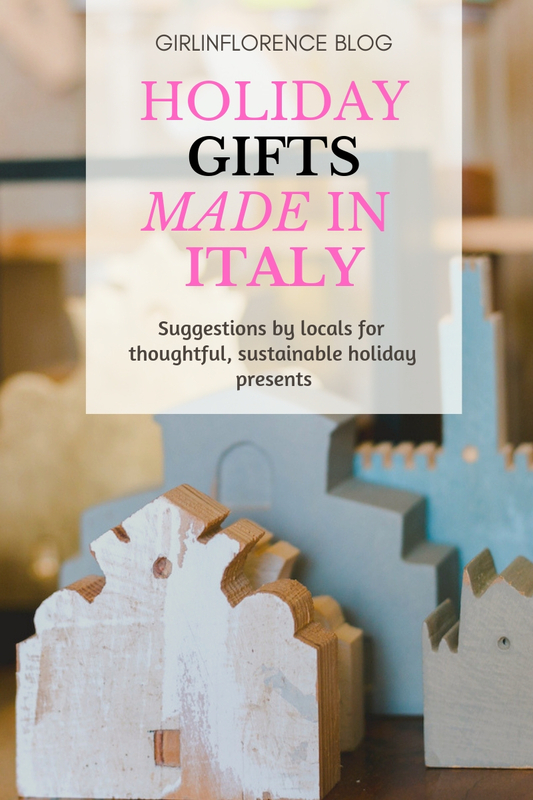 It is the perfect one-stop shop with everything from Officina Nora jewelry, to funky wooden church facades by Jane H. Creations, to stunning leather bags by Le Marche designer Majo Lab…and much more. Being a person who loves literature, she also recommended the Pinocchio set by Richard Ginori is really special. Classic, gorgeous design highlighting a masterpiece of Florentine literature—perfection. I spotted them in a museum gift shop in town, but the flagship store on via Rondinelli is always fun to pop into for a browse. One of my favorite boutique perfume stores in Rome has now opened in Florence. Campo Marzio 70 is on via della Condotta and honestly, the Spiritus Sancti candle (think cold marble, warm bronze and heady incense) by Cire Trudon is a luxurious treat that anyone would love. Loreta Capponi on via Tornabuoni is a staple for exquisite Florentine lingerie and sumptuous children’s clothes, but they also have beautiful smaller gifts like hand-embroidered handkerchiefs that are absolutely to die for. My friend and cookbook author Emiko Davies has the following suggestions: food items as a gift since they’re consumable and don’t add to clutter (let’s face it, everyone can do with less clutter) and make a great option when buying presents for people who are hard to buy for (my parents!!)! 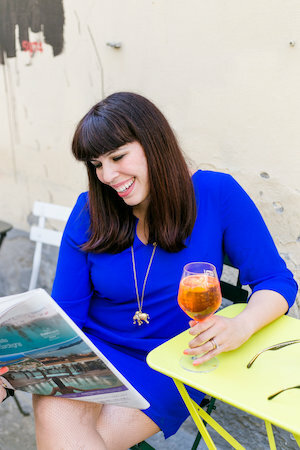 Her number one go-to item is Pasticceria Bonci’s panbriaco from Montevarchi — It’s like a panettone but a thousand times better and soaked in a vin santo syrup. They sell them in beautiful boxes so are nice for presentation too. In Florence I usually go to Pasticceria Nencioni for them. For something really special, a box of Mezzasoma chocolates. These are out of this world — each one is an artwork, made with beautiful ingredients and unique flavours. I also love gifting an organic extra virgin olive oil from somewhere local (Settignano is basically one giant olive grove so I feel like it represents something truly from us! ), such as Fattoria di Maiano. Otherwise if I’m organised in time, another reliable source for good olive oil is Frantoi — they’re based in Siena and work with select olive growers in a handful of regions. You can order online (EU shipping by courier is included) and the recycled packaging is beautiful (they use recycled olive leaves for the sleeves!) so again it makes a very nice looking gift but to order the new oil you have to get your order in by December 4! Something that isn’t food but very useful and also covetable are the handmade knives by Fabio Figus who has a teeny tiny shop in Piazza dei Ciompi. But they say (at least in Japan, so this is something my mother always told me) that giving a knife can bring bad luck in that it can “cut” the friendship/relationship — so in order to get around this little detail, when you gift a knife to someone, have them give you a coin. That way they’ve “paid” for it and the bad fortune won’t fall on your relationship! Ha! Who knows, but in my kitchen-obsessed family, we have gifted many knives to each other back and forth over the years and we all still adore each other so seems like it’s working! Helping mum stock up on presents to take home before she leaves Florence — the little bottega of @fabiofigusknives for beautiful, handmade knives and hand carved olive wood kitchen items is one of my favourite artisan shops (yes, I got myself a present too! That little salt and pepper holder on the bottom). Procacci, Via de’ Tornabuoni, 64R. 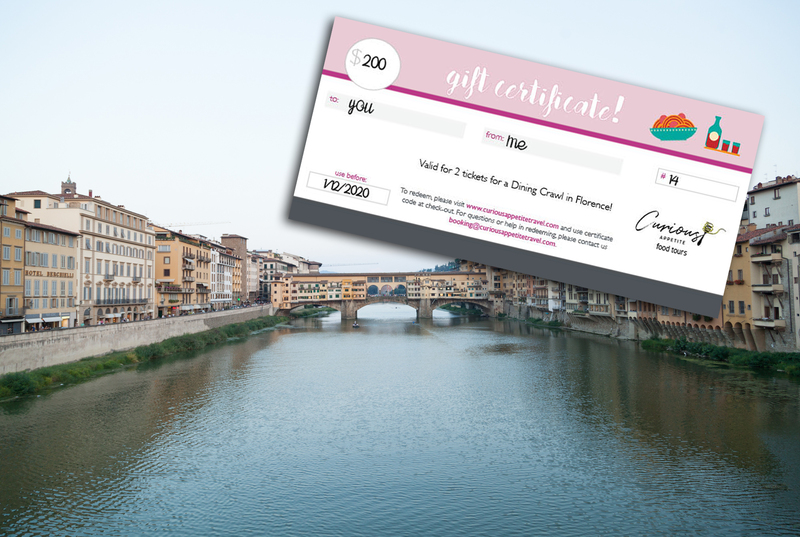 This popular gourmet shop on Via Tornabuoni is a favored stop for the well-heeled set who enjoy their delectable tiny truffle bites and bubbles while shopping the city’s “expensive street” but I prefer it for gourmet gifts for loved ones. They have a lovely selection of concoctions to take home with you including a pistachio creme infused with honey (heaven), various jams and truffle infusions for canapés. I’ve even spotted tons on the truffle front that could make for great stocking stuffers for any true gourmand. Il Torchio, Via del Bardi 17. 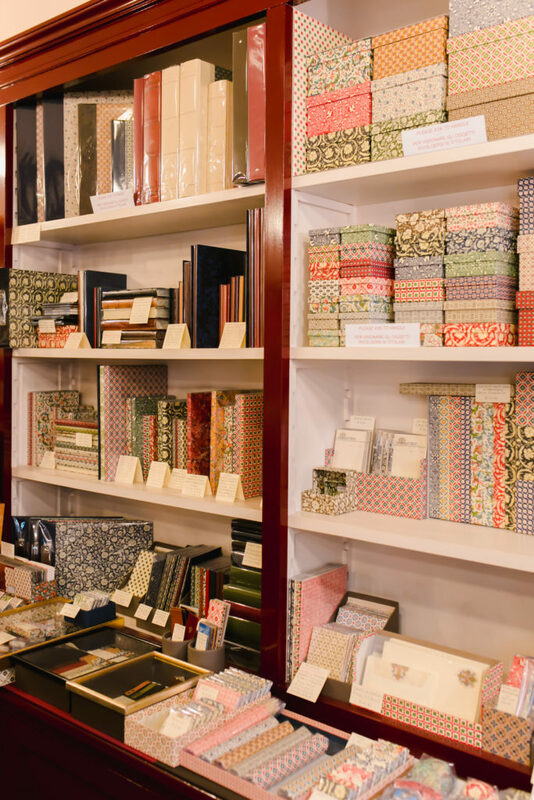 Erin has often been featured on the blog as one of the best artisan book-binders keeping to this treasured Florentine traditional art. I love her hand handsewn notebooks made with marbled Florentine paper and her leather cold holders. Give Erin a visit and have fun customizing your own leather/paper gifts. Madova, Via de’ Guicciardini, 1/red is a must stop when the weather gets cold enough to hide your hands in the pockets of your jacket. 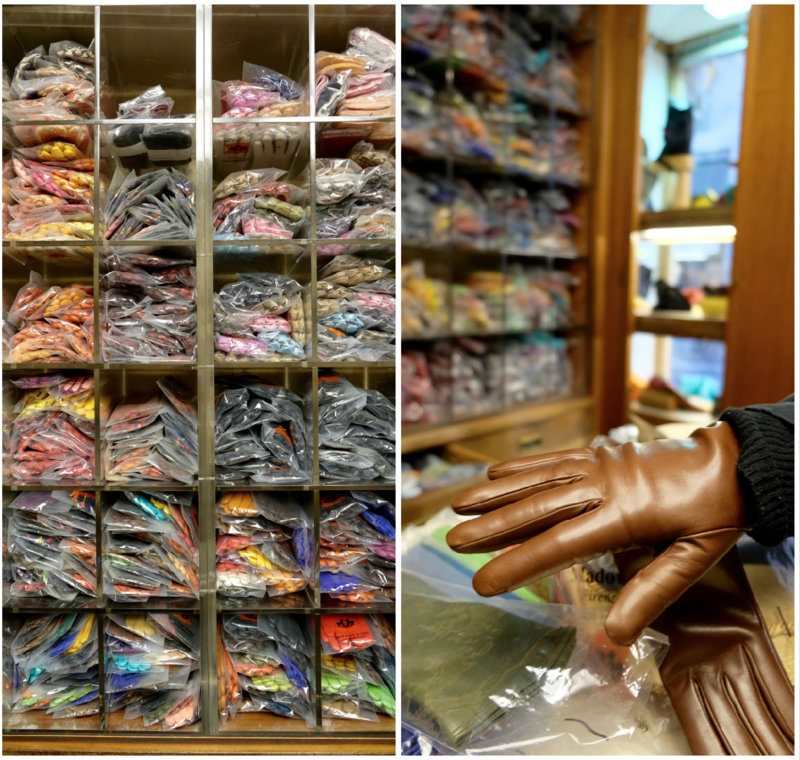 Well known for their bespoke leather gloves lined in cashmere, in Florence, the historic shop of Madova is just a stone’s throw from the Ponte Vecchio. Prices start from around €49.50 for a pair! Jewelry | Officine Nora, Via dei Preti, 4. Hidden in the Oltrarno is the Mechanic-shop-turned-artisan workshop collective that is Officine Nora. You might have seen my piece in Lonely Planet about this place, and I really adore their dedication to beautiful, handmade jewelry (just check out these badass gold “el dorado” earrings by Martina Loncar below!). Prices range on th labor and elements chosen but this is definitely one of my hands-down-top-choices for gifts with feeling this season. OBOFirenze, Via Romana, 42r, is a small shop in the Oltrarno offering a range of very unique and often humorous items with Florentine flair and a Scandinavian design edge. I love these Santo Spirito cutting boards and their pixelated Dante. This year they will bring a Scandinavian Christmas to Florence including graphic textiles as fusion covers in twill cotton and runners in soft linen. They will also have handmade candle holders made from ceramics and a new line of whiskey glasses. Also keep an eye out for their kitchen towels with Dante adorning a Norwegian Christmas sweater! Keep an eye out on their Facebook page for new arrivals! 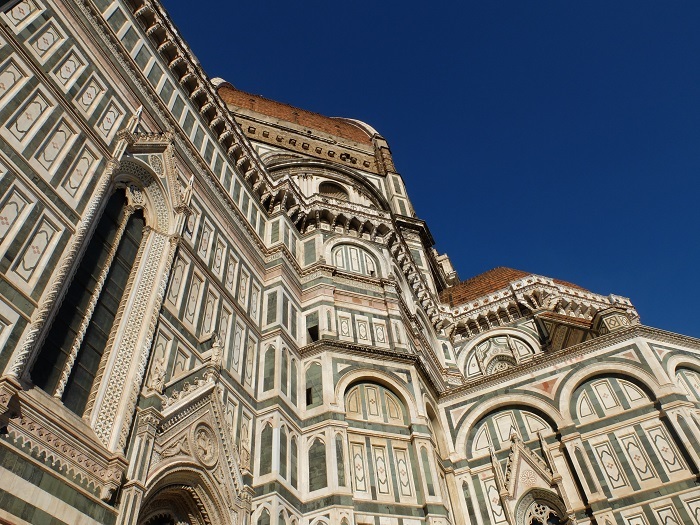 Mary Gray, associate editor at The Florentine shared “There are so many possible gift ideas from Florence! Marvis toothpaste makes an easy, affordable and beautifully packaged stocking stuffer; surely someone has suggested that before, as it’s such a good go-to and an everyday luxury. I feel a little bit heretical suggesting this as a dog owner (sorry, Miro), but my sister and mom are both cat-crazed, so I plan to make sure both of them get the 2019 “Cats in Color” calendar by local graphic artist Sebastiano Ranchetti of PopDesign (he’ll be at the Etsy marketplace at the Student Hotel in early December.) 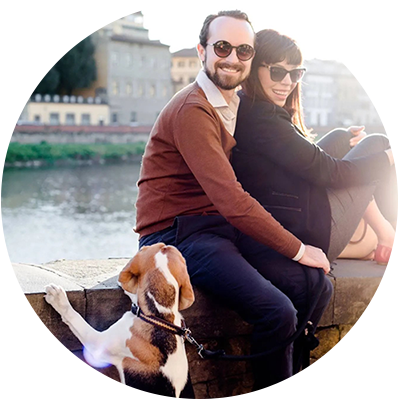 Also, I’ve been eyeing the bags and purses on offer from AVAVAV Firenze.It’s run by a Florence-based Scandinavian couple (don’t be scared away, fellow maximalists!!! Nothing about their handcrafted accessories and garments is drab or starkly minimalist). 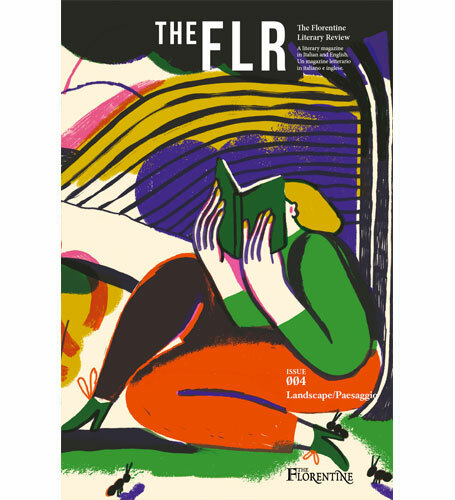 Finally, I’m obviously quite biased on this front, but a print or PDF subscription to The Florentine is a wonderful way to support local journalism and to stay connected to the city and community year-round. My friend Betty Soldi shared her own top gift tips: “Pineider sells some stationery items with my own design, based on “love writing” and some pencils that I have packaged using the old-fashioned name ‘lapis’ so I love inspiring friends to get back to the love of writing, especially with pencils that feel like a non-commital love affair before moving onto the moving-in-together feel of a cartridge pen! Another favorite is the chocolate block from Rivoire, the one that comes in the box with the silver spoon – ever seen or received it? divine. Sometimes it doesn’t make it to the gift receiver but stays on the tongue of the gift giver! Atelier GK on Borgo san Frediano is a personal favorite in San Frediano offering a beautiful selection of bespoke boxes covered in handmade paper and exquisite accessories (I bought Nico a business card carrier and he LOVES it, it also has his initials and cost around 85€). The best way to describe their style is to imagine the skill of Italian craftsmanship over generations mingled with japanese simplicity and that’s what you get at this tiny studio in the heart of San Frediano. When it comes to leather jackets, belts, Benheart, Via della Vigna Nuova, 97-red is quite simply the best. When it comes to quality leather, Ben is your best bet for great quality and a stylish touch, in fact I’ve written about him on Italy Magazine and here on the blog. Both Nico and I have leather jackets from Ben that we adore and a fun gift idea from this shop would be a monogrammed wallet, signature belt (you can pick each part), or a lovely leather-laved bag/laptop case (see below), I have one similar to this below, and it’s basically my hold-all! Uashmama on Borgo S. Jacopo, 30r is a made-in-Tuscany brand is a family business specializing in paper bags turned accessories: wallets, makeup cases, purses that feel like leather and are completely washable made in a special and very durable kind of fabric. My lovely husband gifted me a few of their products and I’m a total convert. One of my top Christmas recommendations for 2018 – products range from around 25€ and up. On the experience gift front what better way to say I care about you then getting someone you love some really great spa experiences for those who you know need a break. My favorite recommendation in town is Relax Firenze, a lovely 360 wellness center offering such an awesome array of massages, EMS personal training, facials, yoga and exercise classes, reflexology ( I love for this) and more. FYI: They are offering (for today) some special deals for Black Friday . 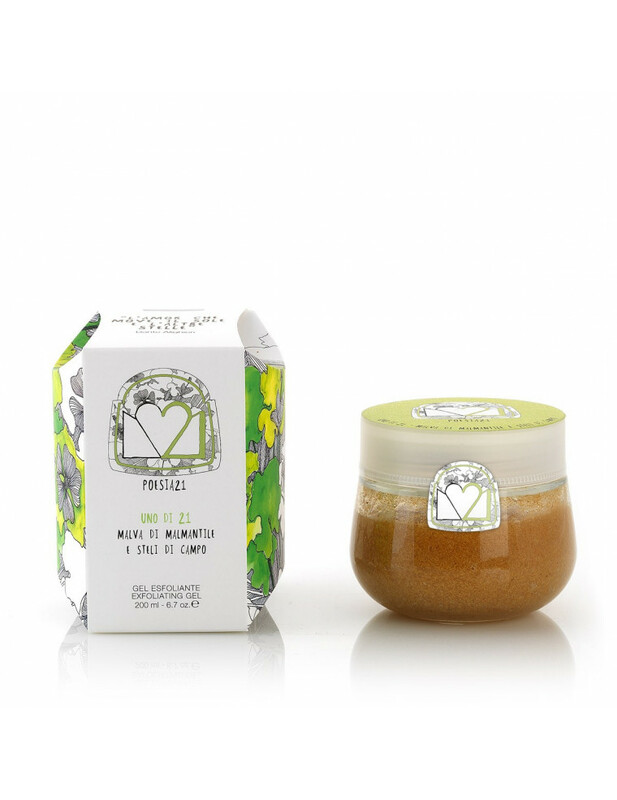 Have a look also at their organic (and vegan-friendly) skincare range from Abruzzo. Here’s where to pick up a gift certificate for their treatments. Rinascimento is a small shop/consortium of artisan-made goods all in one small space on via dello Sprone, 24/r and the couple that runs it is super sweet! You’ll find everything from leather Florentine lily keychains to bespoke throw pillows, art, custom lamps, and a variety of bags. 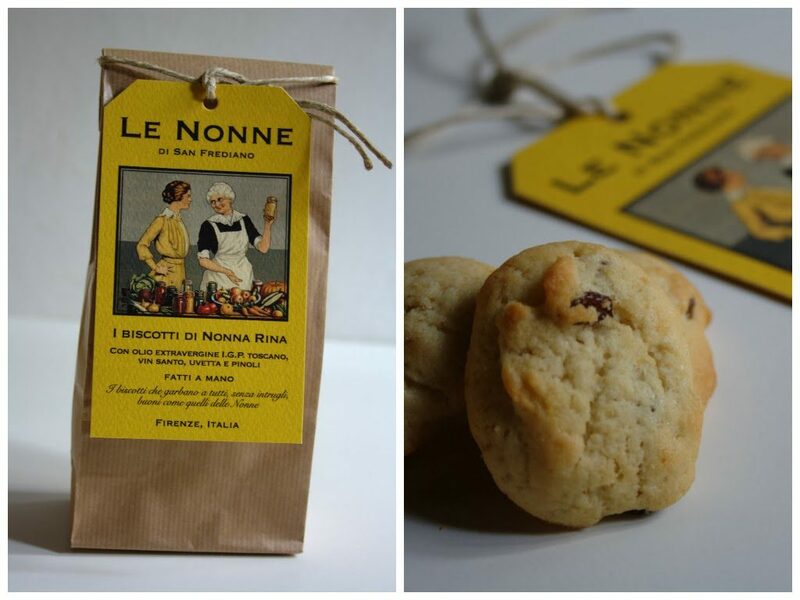 Dolce Emporia on Borgo San Frediano 128R is one of the city’s oldest confectioner’s shop and the perfect place to pick up a pack of these delicious Biscotti (cookies) from San Frediano, a homage to this authentic neighborhood and featuring the delicious recipes of three grandmothers: Nonna Rina, Nonna Ada and Nonna Bice. Alternatively you can pick up a “Cassata Fiorenza” or pandora holiday cake or chocolate covered candies, the list goes on and I’m having a serious craving as I’m writing this post..
Marina Calamai is a Florentine designer and visionary whose work I absolutely adore. She just opened a shop on Via di Santo Spirito 22r (open 3-8pm) where you can marvel at her world of bespoke jewelry, often with Florentine themes. She has a lot of love for her neighborhood of Santo Spirito in the form of earrings, cufflinks for him, and much more. Her dessert-themed line of rings make great gifts for any sweet love in your life. Keep an eye out for her new line of Fiorino (Florentine gold coin) table place settings! My friend Alice Cheron, French femme fatale, offered these fab suggestions. She said “this year, I want to change some items under the christmas tree. We all love Aqua Flor Firenze and Santa Maria Novella, but I discovered recently a lovely brand called Poesia21. A product line all made in Tuscany (body creme, house perfume, cosmetics, all organic). The Price range is great and the packaging is adorable ! I feel very inspired by the feel good quote from famous poetry that you can find on every single product. An example ? Loving this exfoliant (26€) that smell fresh spring herbs. 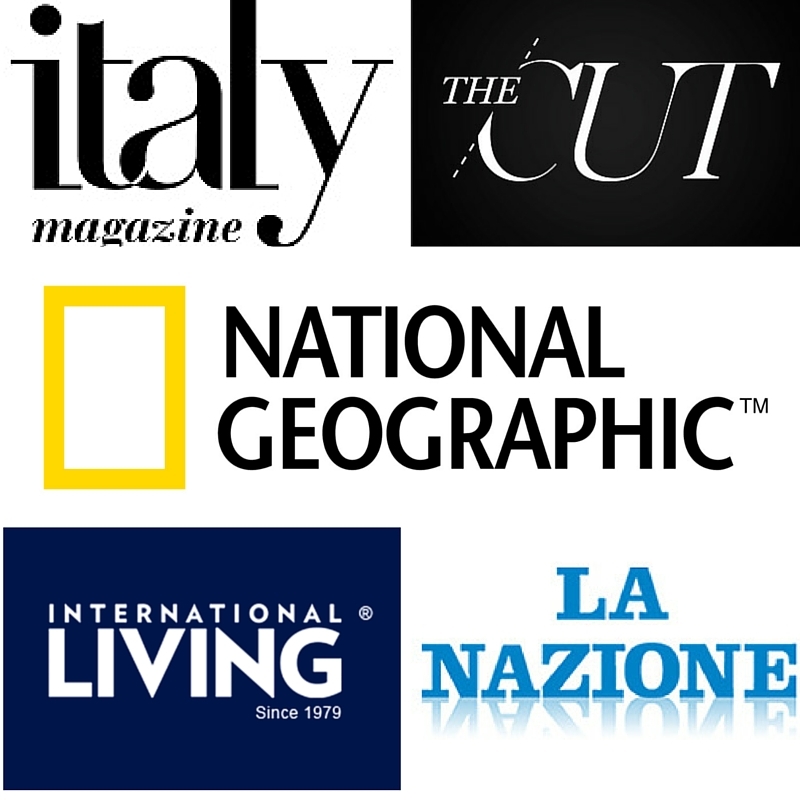 In Tuscany the weekend of December 1-2nd? It’s market-palooza! I will never understand why all of the christmas markets land on the same weekends, making it hard to pick and choose who to visit but alas somethings are better left to be. 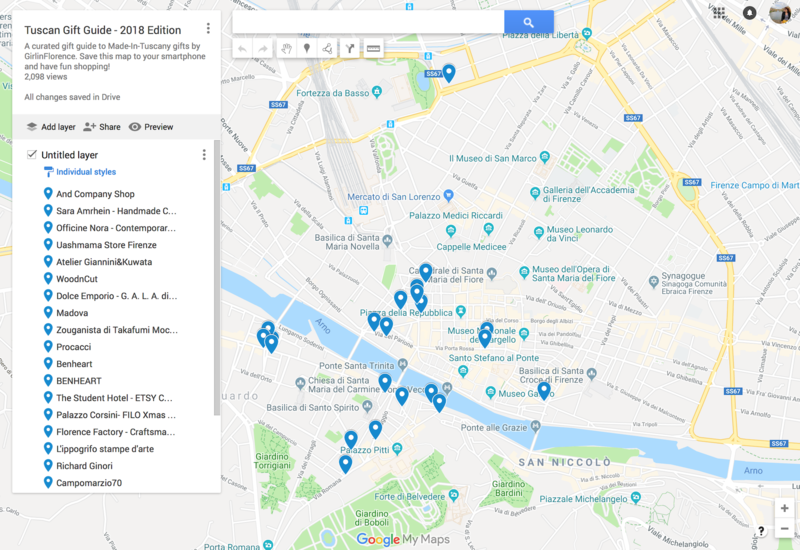 I’m actually feeling generous today so I’ve whipped up a google map with all of the markets you’ll want to visit (I’ll add the info on times/dates too) so you can create your own itinerary to browse the city’s finest. My personal roundup for the month will be out shortly, but enjoy the below festive suggestions for this week/weekend in the meantime. This weekend is going to be fabulous for shoppers who happen to be in Florence. The annual charity Christmas bazaar at Palazzo Corsini “Nataleperfile“ will kick off on Friday until Sunday (Dec 1-3rd), items bought here (a selection of artisan handicrafts, kid’s presents, jewelry and more) will be for a good cause. Even if you don’t buy anything, it’s more than worth it to go and visit the majestic Corsini building. The 43rd edition of the AILO Christmas Bazaar will take place December 1-2nd (3:30-7pm) at the Giardino Dell’orticultura (horticulture garden), a charity benefit market with plenty of artisanal christmas-themed items on offer, plus comestibles and books. Head to my favorite independent bookshop Todo Modo on December 1st from 10-11.30am to buy the English or Italian version of Betty Soldi’s Inkspired book as she will be leading a Calligraphic Conversation about Inskpired with Q&As that will be handwritten between the participants. She will be personalising books, sprinkling stars and bookmarks and making super duper gifts. 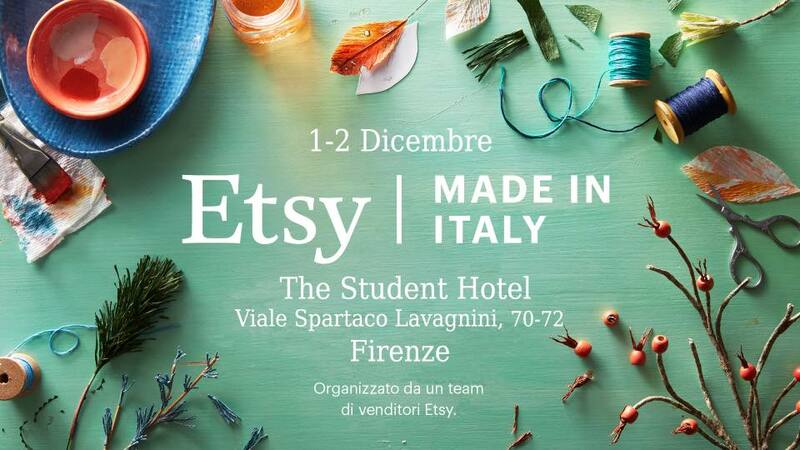 Etsy – the popular online platform, will be hosting a Made-in-Italy Christmas Market the weekend of Saturday and Sunday the 1st and 2nd of December. This is the 2nd year they will be doing the market and this time they are including over 30 local artisans and in a new space: The Student Hotel in Viale Spartaco Lavagnini n70-72. Expect a wide range of interesting items: from textiles, to nature-inspired jewelry, scented candles, notebooks and a lot more. Entrance is free to anyone who wants to come browse, and they will be open from 10:30-7:30pm. The Weihnachtsmarkt or German Christmas Market that annually takes place in Piazza Santa Croce has officially kicked off on November 28th until December 20th (10am-10pm), expect to see mulled wine, holiday gifts, fuzzy slippers and the odor of sausage permeating the air. Oh yeah, I hope they have that burger food truck again, it’s finger-licking delicious. Next up is a contemporary “block party” on via maggio this Saturday December 1st (afternoon to evening ) kicking off at 3:30pm, a street known for its antiquities but which has a more contemporary influence in the past five years. You’ll get to see some of the city’s best shops extending their opening hours and the official turning on of the lights by the local mayor.